Usually, exporting data from InTouch historical data is not an easy thing. Now, we released a stand-alone utility that allows you to export your existing InTouch history data and you don’t have to write any code for it. Commonly referred to as “lgh files” by those familiar with the Wonderware InTouch Human Machine Interface (HMI) software, these daily historical log files contain data for InTouch HMI tags which are typically only accessible using the Wonderware HistData Utility, Wonderware InTouch trending tools, or by migrating the data to Wonderware Historian. 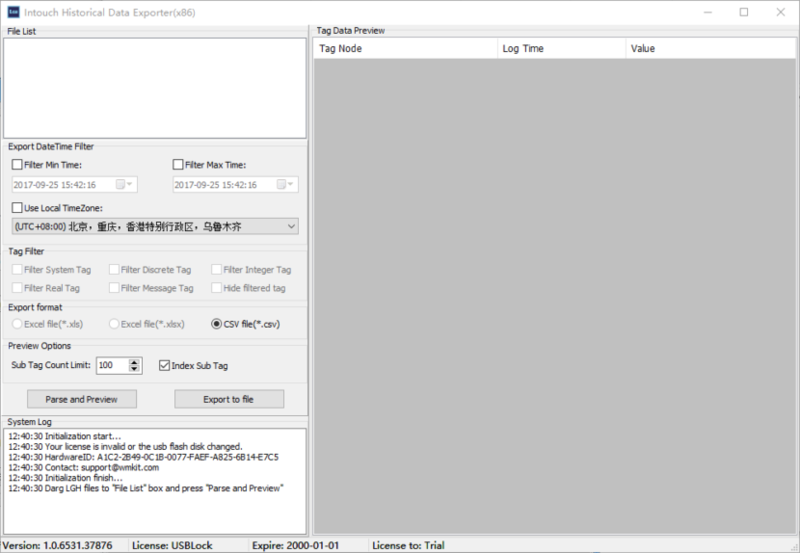 ITHistExporter can open and read lgh files effortlessly through an easy and intuitive user interface that gives plant operators, engineers, and managers the ability to query one or more InTouch tags for a given time frame and then export the results into a CSV file. There is no dependency on the HistData utility or the Wonderware InTouch HMI software. 1.Select and parse Lgh files. 2.select tags and export to csv file. All the raw data in Lgh files can be exported and no data will be lost. So you dont have to warry about your data and nothing will be lost.